Werdum was originally due to face Velasquez in a title rematch. FABRICIO WERDUM IS injured, leaving UFC bosses with a massive headache with less than two weeks to go to UFC 196. 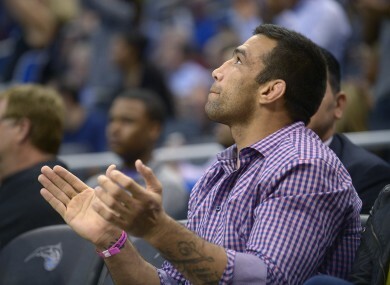 Werdum was originally scheduled to face Cain Velasquez in a heavyweight title rematch on 6 February before Velasquez pulled out with a back injury. Stipe Miocic agreed to fill in and take the shot on short notice, but now MMAFighting reports that Werdum has withdrawn from the headline bout at the MGM Grand Garden in Las Vegas. “I decided not to fight because I’m not 100%,” the Brazilian told Guilherme Cruz. “If Cain was the opponent, I would go on. The UFC 196 card also features the welterweight clash between former champion Johny Hendricks and Stephen ‘Wonderboy’ Thompson which could now be bumped up as the main event. Email “Ah here, now Fabricio Werdum has pulled out of UFC 196 as well”. Feedback on “Ah here, now Fabricio Werdum has pulled out of UFC 196 as well”.